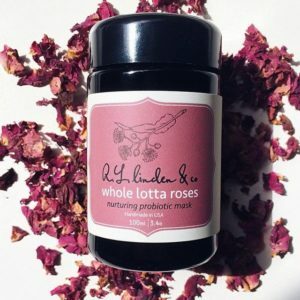 Whole Lotta Roses – nurturing probiotic mask 100ml | r.l. linden & co. The awakening scent of fresh garden roses in this active mask compliments the healing benefits of gentle fruit acids and probiotics, leaving your skin balanced, nurtured and glowing! This pampering powdered mask can be mixed with water, tea, hydrosol, honey, yogurt or avocado to your desired texture. Apply to freshly steamed skin, relax for 15-30 minutes, rinse off with warm water and follow with moisturizer of choice, of course we suggest Time After Time. © 2019 lindenbeauty.com. All rights reserved.